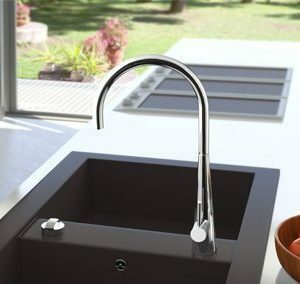 Sleek and beautifully crafted, the Sottile Stainless Steel Kitchen Sink Mixer brings a stylish touch to your kitchen. With a 6 star WELS rating, and a 4.5L / minute flow rate the Sottile Stainless Steel structured Kitchen Sink Mixer is efficient and practical. The mixer boasts Anti-Scald technology, which prevents accidental discharge of hot water to keep you safe from burns. 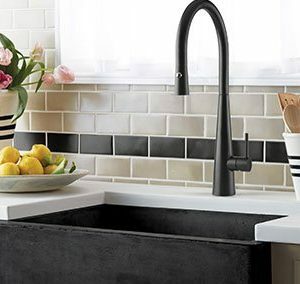 Featuring a Matte Black Electroplated stainless steel design, this sink mixer can complement a variety of kitchen themes. All tapware must be installed by a licensed plumber. 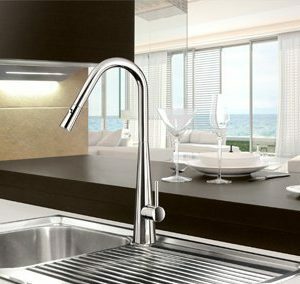 All tapware must be installed to AS/NZS 3500 Series Standards. Isolating stop valve must be installed with all applicable tapware. 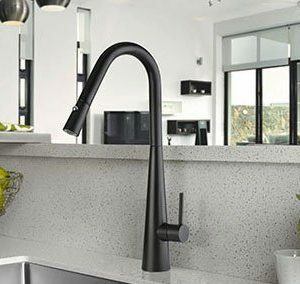 All new connections must be flushed before installing any tapware to remove and shavings or impurities from water lines. If the incoming water pressure exceeds 1200kpa an approved pressure limiting valve must be used. This tapware has not been tested for water pressure under 150kpa. A soft cloth is ideal for cleaning all Electroplated Tapware. Never use an abrasive or harsh substance. Use only mild liquid detergent to remove built-up and tough surface film. Regular cleaning with a soft cotton or microfiber cloth will keep your mixer looking as good as the day you installed it.